The Humane Society of Pike County is located in Troy Alabama. Our focus is on reducing the number of unwanted animals by encouraging Spaying and Neutering family pets. Meetings are held the second Monday of each month at 6:00 p.m. at Troy Bank and Trust (Next to Lowes). All are welcome. 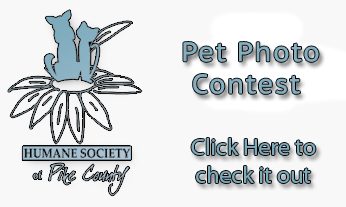 Download the Pet Photo Entry Form Today!